Cruise History: MS STOCKHOLM – Collided with the Italian Line’s Andrea Doria and, as the MV ATHENA, was attacked by pirates. The Italian press called the Stockholm the “ship of death” (La nave della morte). The Stockholm returning to New York after her collision with the Andrea Doria. Her bow severely damaged. 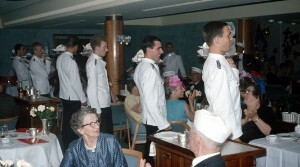 MV Athena (formerly the MS Stockholm) is a cruise ship owned and operated by Classic International Cruises. She was built in 1948 as the MS Stockholm by Götaverken in Gothenburg for the Swedish America Line. Since her career with SAL she has sailed under the names MS Völkerfreundschaft, MS Volker, MS Fridtjof Nansen, MS Italia I, MS Italia Prima, MS Valtur Prima and MS Caribe, before beginning service under her current name. As the Stockholm she was best known for colliding with the SS Andrea Doria in 1956, resulting in the sinking of the latter ship. 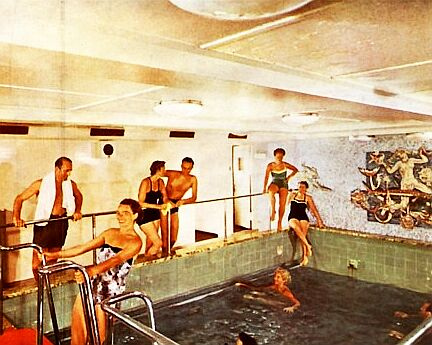 Public rooms, the pool and staterooms aboard the Stockholm. At 525 feet (160.02 m) with a gross tonnage of 12,165, Stockholm was the smallest passenger shipoperating on the North Atlantic route at the time. However, she was the largest ship built in Sweden at the time. Originally designed to carry 395 people, a 1953 refit expanded Stockholm’s capacity to 548 people. On the night of July 25, 1956, at 11:10 PM, in heavy fog in the North Atlantic Ocean off the coast of Nantucket, the Stockholm and the Andrea Doria of the Italian Line collided in what was to become one of history’s most famous maritime disasters. Although most passengers and crew survived the collision, the larger Andrea Doria luxury liner capsized and sank the following morning. 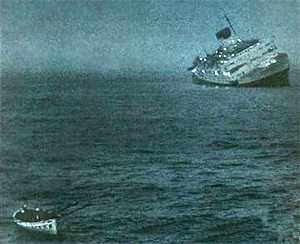 Owing to the collision, 50% of the Andrea Doria’s lifeboats were unusable. However, a number of ships responded and provided assistance, which averted a massive loss of life like that suffered by the Titanic over 40 years earlier. Five crew-members on the Stockholm were killed instantly and several more were trapped in the wrecked bow. Despite its having sunk about three feet (0.9 m), the crippled Stockholm helped in the rescue and ended up carrying 327 passengers and 245 crew-members from the Andrea Doria, in addition to her own passengers and crew. 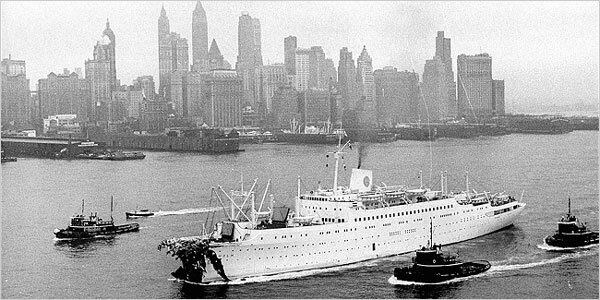 After Andrea Doria sank, Stockholm sailed to New York City under her own power and arrived on July 27. The crushed bow portion was repaired at a cost of US$1 million three months later. 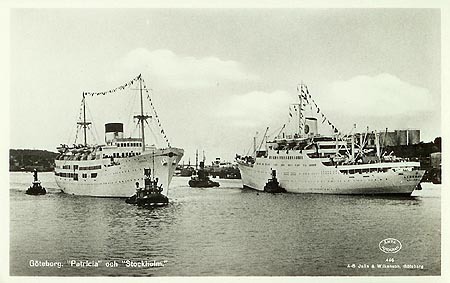 Swedish liners “Patricia” and “Stockholm” . 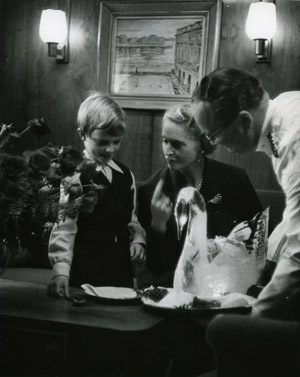 On January 3, 1960, the Stockholm was sold to the East German government, who renamed the ship Völkerfreundschaft and operated her as an ocean liner until 1985. In 1985 she was transferred to a Panamanian company “Neptunas Rex Enterprises”. Her name was reduced to Volker, and by the end of the year she was laid up in Southampton, England. She was later used as a barracks ship in Oslo for asylum seekers in Norway under the name Fridtjof Nansen. 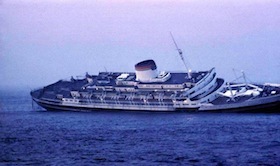 The Stockholm was sold to Italian interests in 1989 and towed to Genoa, the Andrea Doria’s home port. When she first arrived, the press called the Stockholm the “ship of death” (La nave della morte). She was rebuilt from the waterline up and given a modern cruise ship design. Named the Italia I, then Italia Prima, she later sailed as Valtur Prima primarily to Cuba, and was laid up there in 2001. Acquired by Festival Cruise Line in 2002 and renamed Caribe she continued to sail to Cuba. Since 2005, the Stockholm sails as the Athena and is registered in Portugal. 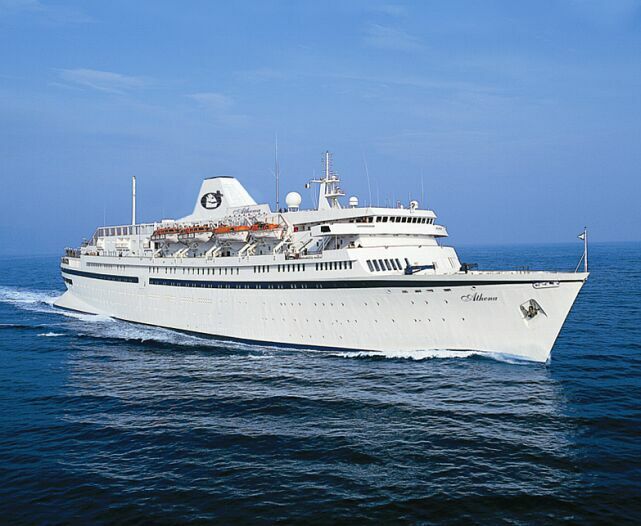 She is now flagged out of Cyprus operating for Classic International Cruises. On 3 December 2008 MS Athena was attacked by pirates in the Gulf of Aden. There were reported to be 29 pirate boats surrounding the ship at one stage until a US Navy P3 Orion maritime patrol aircraft circled above which led to some of the pirates to flee. The crew prevented the pirates from boarding by firing high pressure water cannons at them. No one was injured and the ship escaped without damage and continued on her voyage to Australia. Among its oceangoing sisters, the S.S. Stockholm has always been infamous as the ill-fated vessel that struck and sank the Italian liner Andrea Doria in dense fog off Nantucket 50 years ago. The collision — on July 25, 1956 — resulted not only in 51 deaths and the daring rescue of hundreds from the swells of the Atlantic; it also assured a name for the Stockholm as “the death ship” of the high seas. Nonetheless, on Wednesday morning, there it was: sailing through the narrows, up the Hudson and docking at a West Side pier. Yesterday it sat with anchors at Pier 90 — albeit with a new hull, new innards and a new name. The famed ship, rechristened Athena last year, had arrived in New York at the end of a trans-Atlantic cruise with a manifest of Britons, many of whom were aware — and apparently unfazed — by its macabre past. The ship’s return to New York City may have a close approximation, in human terms, to the convict sentenced to 50 years for murder who completes his sentence and revisits the scene of the crime. It was the vessel’s second journey to New York in recent years and its maiden trip to the city as Athena, sailing for the British outfit Classic International Cruises. Ms. Anderson and other passengers said the 40-foot swells and gale force winds were in fact so strong that an unfortunate 70-year-old doctor was knocked to the floor on Tuesday night and died. His body was disembarked in Halifax, they said. Representatives from Classic International Cruises, based in Southampton, England, did not respond to phone messages seeking comment. By far, the ship’s most famous fatalities were the five members of its crew who perished in the collision 50 years ago, which reads in accounts of the day like a particularly well-designed disaster movie. 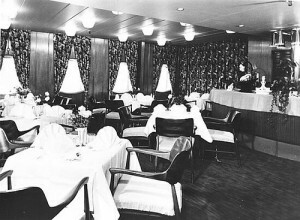 Aboard the Andrea Doria: Hungarian ballet dancers rushed the promenade deck in their underthings; a Hollywood actress ran from the smoke-filled Belvedere Room to rouse her sleeping 3-year-old; a Canadian nun hurriedly donned a life-preserver; and a group of oil executives had both their cocktails and their bridge table knocked from beneath them by the force of the blow. The Stockholm had been steaming east toward Scandinavia when its ice-breaking prow rammed the starboard side of the Andrea Doria, which had been due to arrive at Manhattan’s 44th Street Pier from Genoa. The Ile de France, sent to rescue the Andrea Doria’s 1,134 passengers, circled the capsized vessel, which sank 11 hours after its hull was torn apart. Meanwhile, the Stockholm, with 550 passengers of its own, limped back to New York where it docked at Pier 97, only blocks from where it rested yesterday. It was Paddy who pointed out Athena’s riveted hull, angled prow and small size: all signs of an older ship. Then he drifted off on a memory of just how glad he was that Ruth Roman, the actress with the 3-year-old, had survived. The question was whether a salt like him considered Athena irrevocably tainted by the past. 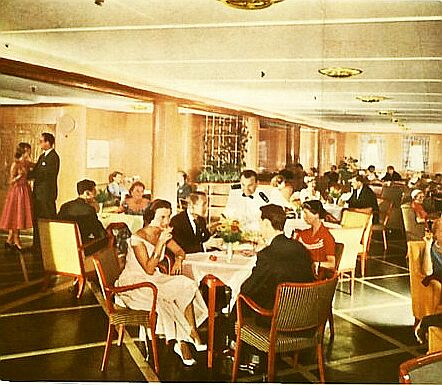 SS UNITED STATES – The last American liner still afloat. But for how long? 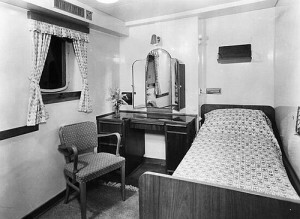 1936 German/Nazi Olympics were a destination aboard ships of the North German Lloyd Line.